The new members of NHS, starting the lighting of their candles. 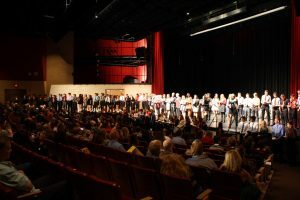 The National Honor Society inducted 112 new members, according to coordinator Melanie Lyons, on Oct. 21. The Induction Ceremony started with the president of the HHS NHS section, Cameron McCall. He had many inspiring words for the students and for the parents of the new members. From there, the rest of the NHS board spoke about various things related to NHS. Then, it was time for the new members to be inducted. Each current member of NHS, inducted one or two members. The induction consisted of the current members reading off the name of each new member, the parents’ names, and a little bit about the new member. Following the induction of each new member, McCall and the three other members of the NHS board explained the four pillars of NHS: Scholarship, Leadership, Service, and Character. Each pillar had a candle to represent it, and although their was a little hiccup, the lighter would not light, the ceremony continued on. Principal Scott Rowe said a few words, about his time as an NHS member and how he looks forward to seeing what the new group of members will do for the school and community. The new members of NHS then recited the NHS Pledge and lit their candles, an induction ceremony tradition. The lighting of everyone’s individual candle signified the NHS values the members were expected to uphold and the commitment to helping the community and the people around them. The ceremony was followed by cookies and juice, and many photos taken by proud parents.